In this subprogram pin 3 is set as “INPUT” and in “LOW” state; pin 2 is set as “OUTPUT” and also in “LOW” state. 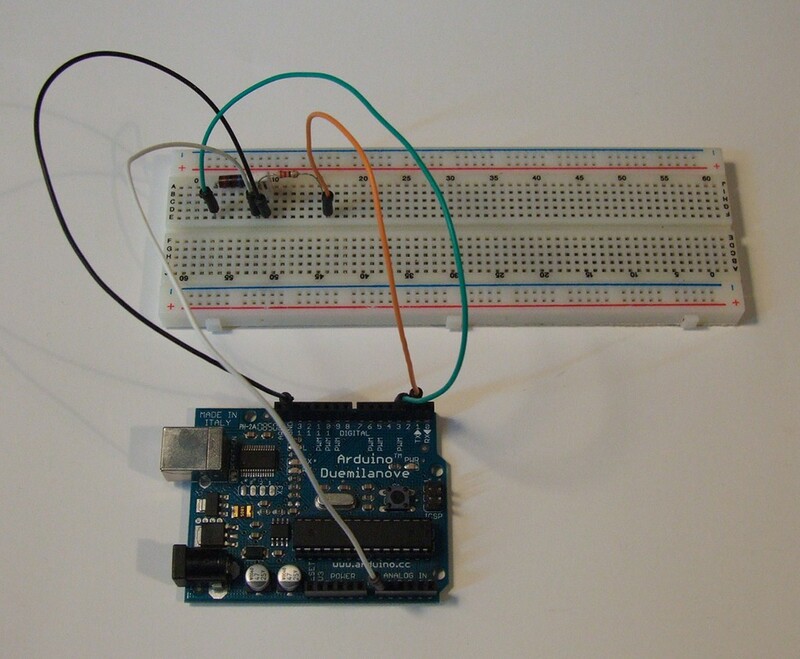 This makes the current to flow from the capacitor to the discharging resistor. Discharging level is monitored by analog pin 0. By reaching 0V, the program ends. 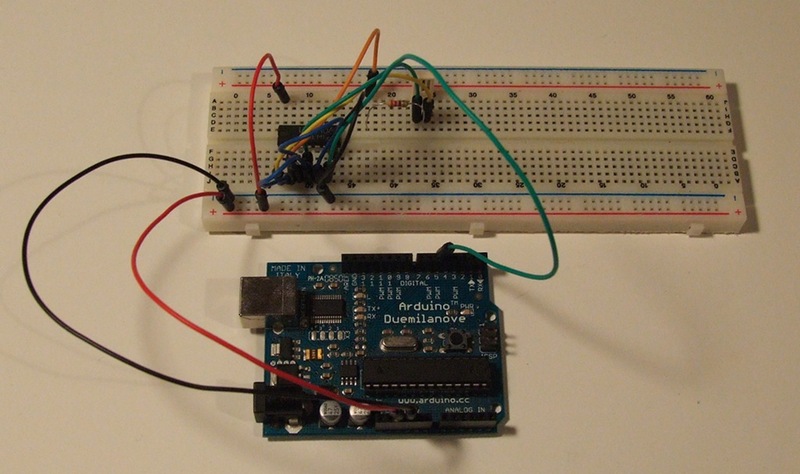 Charging subprogram sets pin 3 in “OUTPUT” mode and in “HIGH” state; pin 2 in “INPUT” mode. 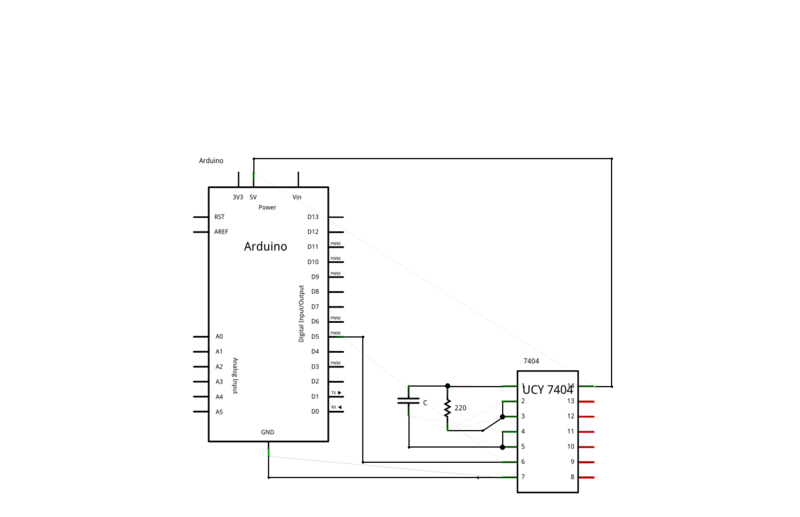 Analog input pin 0 is monitoring charging level. 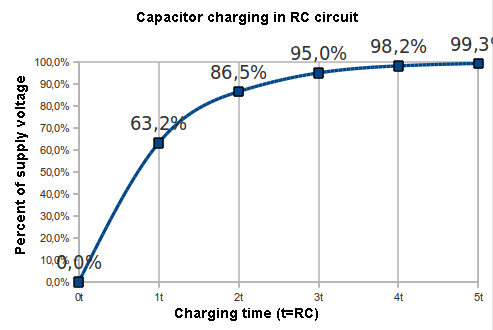 Simultaneously, the time of charging is counted by “micros” function. This makes the current to flow from pin 3 through charging resistor to the capacitor. 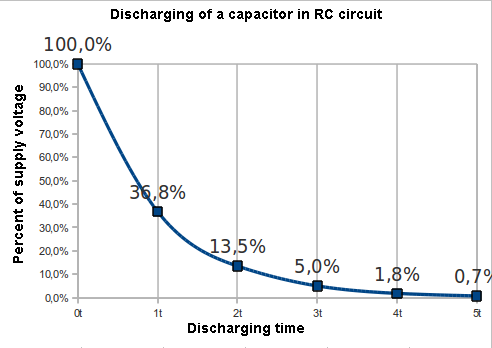 This function returns the capacitor charging time (to 63,2%). The time is counted in microseconds. Of course it’s possible to increase the charging level. It will cause increased accuracy and decreased frequency of measurements. 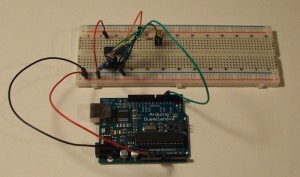 If you have assembled the circuit properly, run the first example. It returns the capacitor charging time through “Serial Monitor”. Interestingly, instead of planned 3300 µs there is about 4300. If returned values are more random, try to touch something metal and well grounded (e.g. a radiator). Perhaps source of these interferences are you. 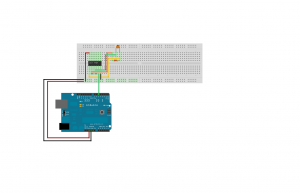 To check the impact of Arduino signal wires on the circuit, you can experimentally make them stick together or separate from each other and check in which way it changes the final value. For me, with the wires sticking together it increases to more than 1000 µs. I would therefore draw attention to the accuracy, quality and stability of operation of the circuit. We can assume that the capacitance of the circuit is parallelly joined with our sensor. Because total capacitance of two capacitances joined parallelly equals their sum, we can substract this sum from the result returned by the program, which will give approximate capacitance of the sensor in a certain moment. Of course, nothing in the world can not accept that the program returns accurate value. There always must be reference points. This exactly is callibration. It’s all about putting the sensor in a certain environment, whose parameters are known. For better explanation, I’ll use temperature sensor as example. 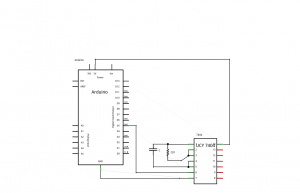 If we connect the temperature sensor to analog input, we can’t assume that certain voltage described by the manufacturer denotes a certain temperature. 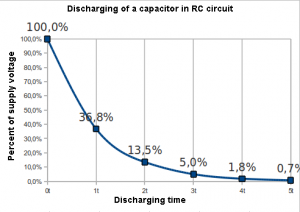 There always are unwanted resistances and parasitic capacitances, falsifying the measurement. Because of that we must manually calibrate the sensor, which means to create a surrounding, whose temperature is known to us. As we remember from physics, the water has two states in which we know the temperature hardly in 100%. The first is ice with 0 °C, the second – boiling water – 100 °C. 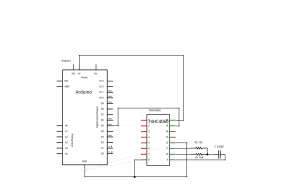 After covering the sensor, in order to protect the terminals from water, we are putting it alternately in this two environments and writing down values returned by “analogRead”. These are our reference points. Assuming every sensor is linear (what means temperature increase is directly proportional to increase of voltage emitted to Arduino) and you have some skills in math, you probably know the linear function equation is y = ax + b. It will be the base of our callibration. So, we have 2 measurement values and 2 temperatures constituting a equation system with two variables: “a” and “b”. Of course, I wrote this for better explanation. 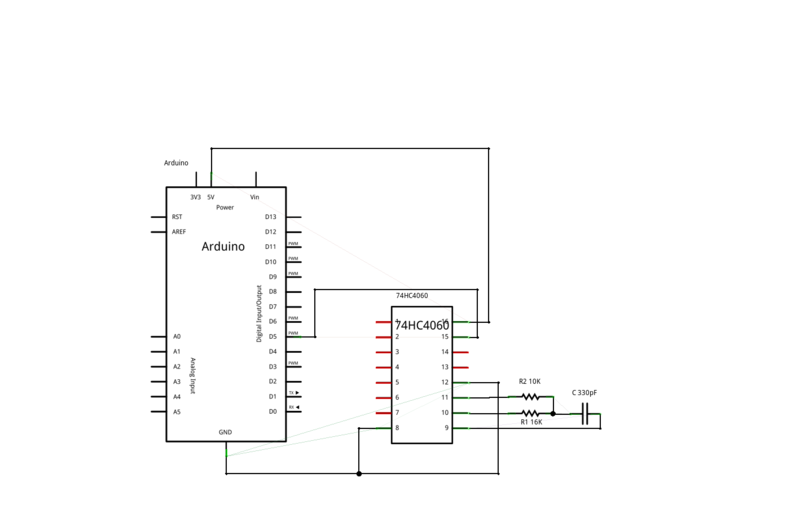 Arduino IDE has a proper function solving such an equation. This function isn’t limited by given range. Out of range arguments would be also converted properly. Put the paper towel in a oven for a hour. It must be bereaved of all moisture. After that, put it into paper bag with the sensor. Wait until the sensor shows the lowest value and write it down. Pour boiling water over the paper towel and put it into plastic bag along with the sensor. Moisture can’t get into the terminals or the measurement will be invalid. Wait for the highest value and write it down. It’s better to put only the sensor in the bag, especially for 100% humidity. 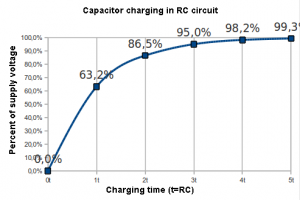 If the sensor is on extended wires, they must be stable not to vary circuit capacitance. Sensor’s terminals must be well covered, in order to keep vapor water away from them. When we finally have the results, we can create function returning the humidity in proper units. After adding this function the program might change its characteristic and require another callibration. Above circuit is pretty “academic” method. It could be tuned out by adding next part to the code. In the reference there are two example circuits based on 555 timer. The first converts humidity to frequency, the second generates PWM impulses, where the pulse width depends on humidity. We’ll take up another aplication based on 74hc4060 chip. This IC is integrated frequency generator and divider. Is it true that it reminds us something? Of course, another divider can be choosen. The smaller divider, the higher accuracy. In such a circuit, the frequency can be read with “FreqCounter” library. The callibration is done like in the previous case, by writing down values for peripheral values and scaling them to normal values using “map” function. This time any additional changes in program code shouldn’t turn the callibration out. I found in wardrobe a old IC – UCY 7404 in TTL technology, manufactured by non-existing today Polish company – CEMI. It also can be used to make a generator. I used 330 Ω resistor. We are using the same program, paying attention to far higher frequency. 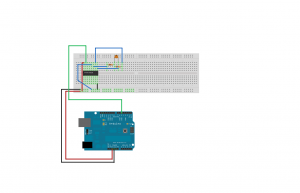 when i uploaded it in arduino uno. it said ‘FreqCounter has not been declared’ . why ?